Audi has officially unveiled the 2014 RS6 Avant. 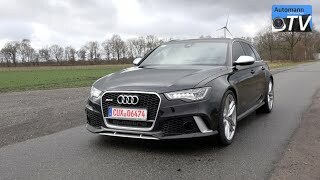 Eight-speed tiptronic transmission, quattro all-wheel-drive with sport differential, standard RS-specific adaptive air suspension with option of steel-sprung suspension incorporating Dynamic Ride Control (DRC) makes the RS6 Avant an high-performance sports car for everyday use. There is also a tailgate-mounted spoiler, a gloss black rear diffuser, a dual exhaust system and 20-inch alloy wheels. 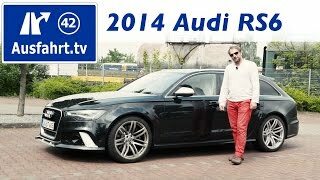 The 2014 Audi RS6 Avant is powered by a twin-turbo 4.0-liter V8 engine that produces 560 HP (412 kW) and 700 Nm (516 lb-ft) of torque. It can accelerate from 0-62mph (100 km/hr) in 3.9 seconds and hit a top speed of 155 mph (250 km/hr). The top speed can be increased to 174 mph (280 km/hr) with the optional Dynamic package and 189 mph (305 km/hr) with the optional Dynamic plus package. At the same time its smaller displacement and cylinder-on-demand technology will make 28.8mpg economy potential a reality.